** We'll have a 'Learn Something New' weekend. Send me some ideas (in the comments below) about 'new things' you would like to learn. I'll do a video on some of them during the year. ** "Finish it Up/Start Something New" (FIU/SSN) - Many people have told me they REALLY want to "Finish Up" some of their projects in progress... like my Block of the month quilts they did in 2005, 2006, I Believe, Times Remembered.. etc. All year I'll be running 'Cheerleading Sessions' to finish up a project. As a reward for working on a project that needs to be completed, you will then "Start Something New" which means you can start a New project as a reward! I think this will be a perfect sewing year, finish things up, and start new things... yep... a very good year! 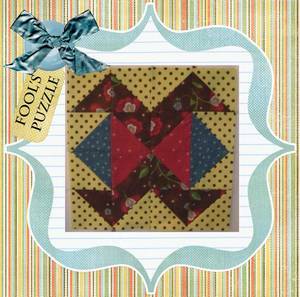 **'Make it Together' quick projects - These will be small projects we can do over a weekend. If you have ideas post them in the comments, I have a list started, including an idea for a Valentine's Day Tree! ** During the year I'll host several 'Make a Charity Quilt' weekends. This year I'd like to encourage you to find a local group to donate a quilt to. This way you do something good for someone AND connect to your community through your charity work. There will be more details as we get closer to the dates (I have not picked dates yet.. but you will be the FIRST to know when I do!). 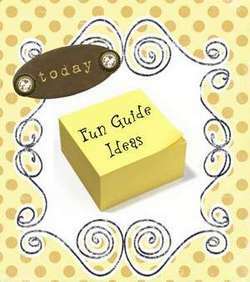 I have so many ideas that my monitor is overflowing with sticky notes!! Stayed tuned for more in the next few weeks. To kick of January sewing we are going to work on a "Finish it Up" (FIU) project. If by chance you have NO project that needs worked on, call me and I'll send you a few.. ha!!! Or you will start something new, which is way fun isn't it? For the majority of us, we have a project that needs finished. ---It may just need a binding (do it by machine.. so fast.. see my books and tip page). ---Maybe your shapes were misplaced for the applique. January 1-5 is your time to FIND A PROJECT. I highly recommend you select one that is ALMOST DONE. This is good because you'll finish quickly and then you can start something new.. hehe! Send me a comment and tell me what you have selected to work on. I'll have to you work on a "FIU" for awhile then we'll switch to a "SSN".. so you can be dreaming of your new project while finishing the current one. The next Farmer's Market Block are my step-mom's favorite item, strawberries (or straws as she calls them). Karen grew up in England on a farm where they grew lots of fruits and vegetables. She is very fond of a just picked strawberry... mmmm... so am I! 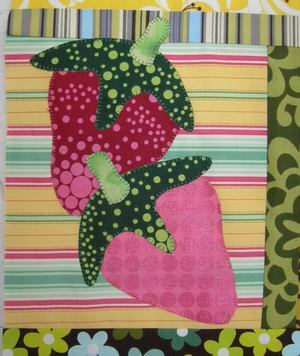 I also posted a photo of my background, sashing and blocks so far, enjoy them on the FREE pattern page. Also scroll right to the bottom to see all my blocks with in the layout I gave you last month. See all those BLANK areas? That is where the FUTURE blocks will go. I gave you the layout in December so you can create a co-ordinated background before you had all the blocks. This is a mystery, so you are getting one block a month. I hope that makes sense since I had some questions on the blank blocks. My friend Cathy says mine is a 'City Farmer' quilt.. hehe! I'm as urban as I can get in the suburbs... LOL! Did that title grab your attention...hehe!! 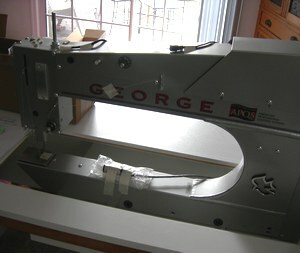 The 'New Boy' is my Rock Star new 'George' machine! This is when we just inserted the machine into it's table. We are doing some videos, photos, etc.. so stay tuned for more on this great quilting machine. Read more about George HERE at the APQS website. I adore a really nice, light, thin, and tart key lime pie. I can still TASTE the best one I ever had at a restaurant in Williamsburg PA! This month Gregg and I will be in Florida to board the Cruise ship to teach, then we'll spend a few days in the south to soak up even a bit more warmth and sun. Two Key Lime Pie recipes are now on the NEW Recipe page of my blog.. yeah you! CLICK HERE to get them. I'd love to have recipes of yours to share during the year. I'll put out suggestions and if you have one in that category you can send it to me!